Button, Button, Who Has New Shirt Buttons? We are proud to be able to offer you these fabulous shirt buttons that come to us straight from a famous Italian designer’s workroom…at a great low price ! We photographed the buttons on different colored background fabrics to highlight their versatility. Remember…Yes, you CAN use contrasting buttons on shirts and blouses…just like the top designers do ! 4 Round Felt “button backers” for use behind Collar Buttons to stabilize the fabric. And before I forget... many new styles and colors have been added to our popular Shirt/Blouse bulk "Buttons-by-The-Scoop" assortments too! and all the NEW Designer Shirt Button Sets. 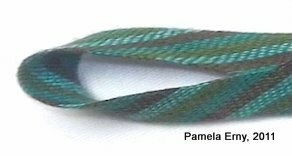 TUTORIAL-- Fast and Fabulous Fabric Loops! I do not have much time to sew these days, but I do have time to show you how I make "fabric loops"...for functional purposes. There is such a loop included in the Colette Patterns Negroni Shirt. There are similar methods for making a length of tube to use for multiple buttons, however please note that this tutorial shows how I make a single flat loop for the specific purpose of replacing a buttonhole at the very top of a Convertible Collar shirt. To make a single button loop, first start by cutting a strip of fabric on the bias that is about 1" wide and about 3" long. Then as shown above, fold it in half width-wise (RIGHT SIDES TOGETHER) and "finger press" along the folded edge to make a center crease. 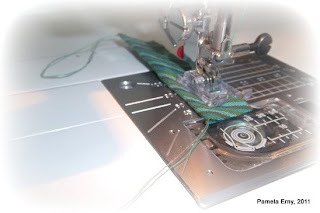 Now at your machine, pull out a long length of both the bobbin and top thread. 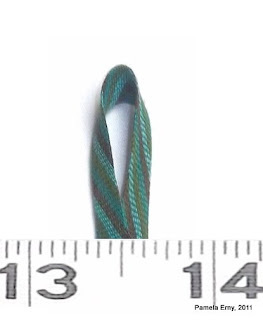 As shown above, leave a loop of both thread tails behind the presser foot. Then lay the rest of the pulled thread tails along the inner "valley" of the fold you made in the fabric strip. What we are doing here is making our own "tool" out of thread, that we will later use as a handle to easily turn our loop! 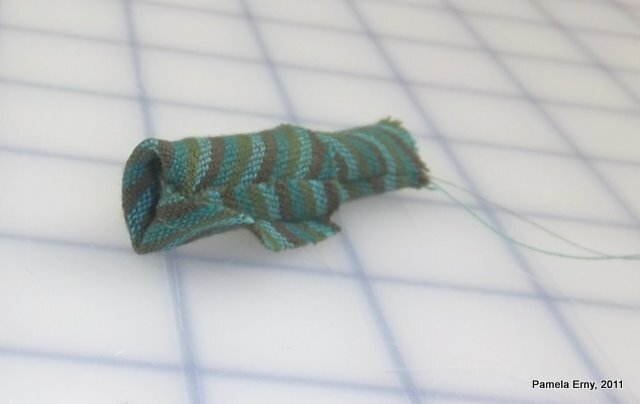 Fold the bias strip in half, enclosing the thread tails as shown above. 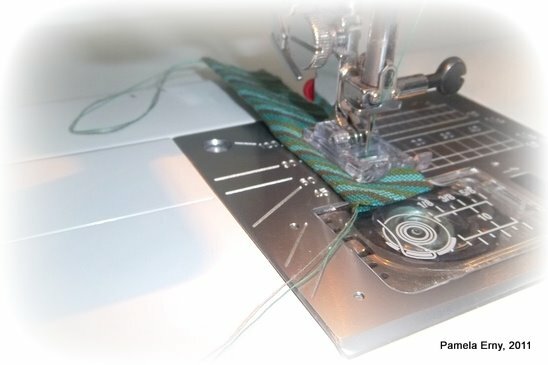 Loosen the top tension of your machine a little bit (if it is set at 5 for instance, loosen to 4.5).... then stitch a 1/4" seam. 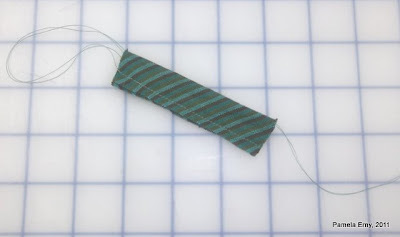 The photo above shows what your stitched bias strip will look like after it is removed from the machine. 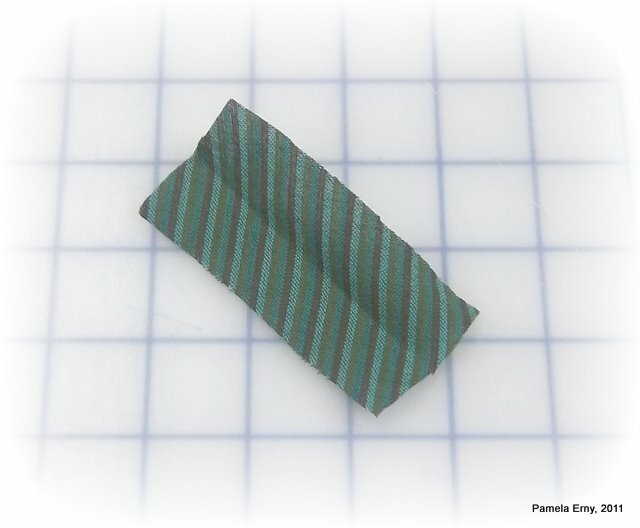 Note that the thread tails are attached at one end of the seam, but loose inside the fold of the strip. 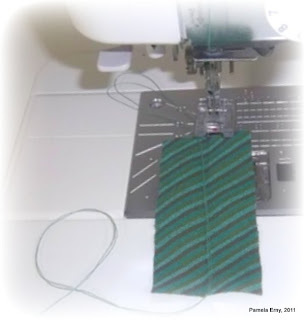 Now grasp the UNATTACHED thread tails, and start to gently pull them...turning your sewn bias strip right sides out. Continue pulling those thread "handles" and turning the tube until all the seam allowances are inside. Then take your turned strip to your pressing surface and press it flat, with the seam along one edge, as shown above. 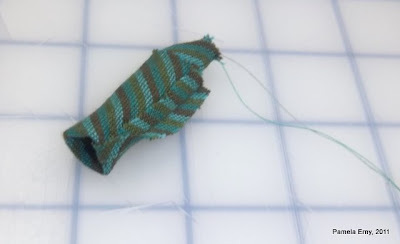 Now trim the ends, cut to the desired size, form your loop, and insert according to the pattern instructions.